We are offering a comprehensive range of premium quality Vari Mixer to our clients. 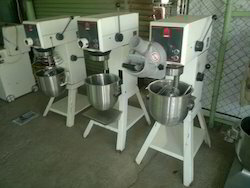 These VariMixer are suitable for making cake mixture, bread mix, cookie mix. 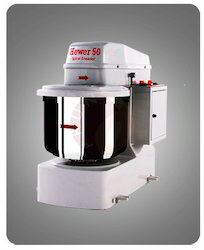 Efficient mixer for cake making and bread making industry. Mixing container made of S.S. and variable speed can opt the different speed control by Belt. This specialty bread base of 8 grains has been formulated using the finest ingredients including flax seeds & wheat, soya grits, barley, oatmeal, corn grits, rye and millet. These seeds are all high in protein, fibre, vitamins and minerals and coupled with wheat flour, they produce nutritious and delicious multigrain bread. In order to keep pace with the never ending demands of customers, we are involved into offering wide range of Bread Mixer. IFFCO INGREDIENTS is a leading manufacturer of bakery ingredients. We manufacture a wide range of specialty bread pre mixes such as Health Bread, Country Grain, Alpenburg, Blue Bend, Wheat Meal Dark, Stoned Gold and Soft Roll Mix. Our bread mixes are prized for its taste, texture, aroma and quality. Perfect Bakes Machine Pvt. Ltd.
We introduce you as one of the leading manufacturer, exporter and supplier of the food processing machinery. We have an exclusive range of Bread Plant Mixer offering to our clients. These machines are prepared with high-grade raw material, which is received from the authentic and respectable vendors of the market. Furthermore, the variety of machines offered by us is screened on a countless well-defined variables to be sure their compliance with international standards. the dough mixer is used for mixing various ingredients for such as flour, sugar, fat, water, and other chemicals for making hard, soft or fermented dough for making biscuits.